Are your circular saw blades just not “cutting it?” Has your old carbide tipped saw blade lost its luster? The team at USDiamondTool.com knows your pain and offers a variety of high-end carbide tipped and abrasive saw blades that are ready to slice through a variety of surfaces. These tough blades are built by Milwaukee to last, making sure that your investment continues to cut through the necessary surfaces in a fast and efficient manner for many years. Finding a quality carbide tipped saw blade is very important. Our business stocks the best blades available, offering them at a price that you won’t find in other places. 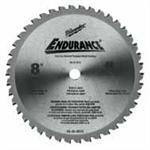 Additionally, we carry abrasive saw blades that are perfect for cutting hard metals. Check out the circular saw blades that we sell to find the right selection for your Milwaukee saw. Our business understands your needs and makes sure that you have access to only the best blades available.